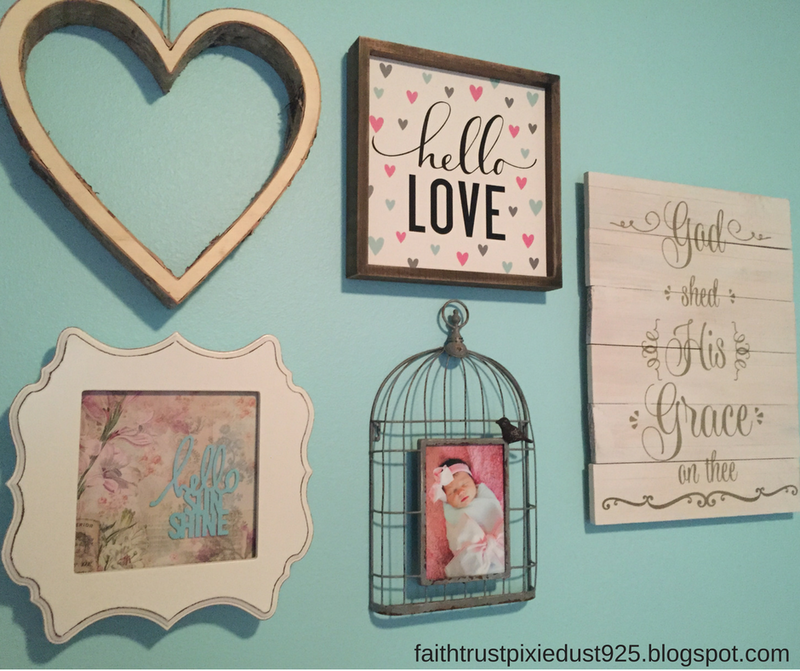 I have to say, I had a ton of different ideas floating around in my head (and pinned on Pinterest) for this sweet little girl’s nursery. I LOVE blue and pink together so I ultimately decided to go with an aqua and pink color scheme with bird accents. We were able to use alot of the furniture from Raley’s nursery, so we didn’t have to buy a new crib, changing table or rocker. The only thing we had to get was a bookcase and some decor. I absolutely love how it turned out! *Updated with photos of baby girl by Elles Photography! We love them all! The window pane I found on the side of the road, cleaned it, and repainted it. The crib bedding was made by my amazing grandmother. Definitely something I will cherish forever! I made this ribbon mobile by just using a cross stitch ring and cutting up a bunch of ribbon. I hung it from the motor from Raley’s mobile so it will sing and spin. I am absolutely obsessed with the bracket. I had seen pictures of brackets like these and looked at a few different stores for them but couldn’t find what I was looking for. Finally I realized I was looking for the wrong thing. It’s actually a plant hanger! I ended up finding it in the garden department at Home Depot. -Pacifers, meds, Q-tips, baby nail clippers, etc. We added this shelf in her closet for $30. We added one in Raley’s room before she was born too. It works out perfect because I’m short and don’t like reaching up high for things that I need frequently. 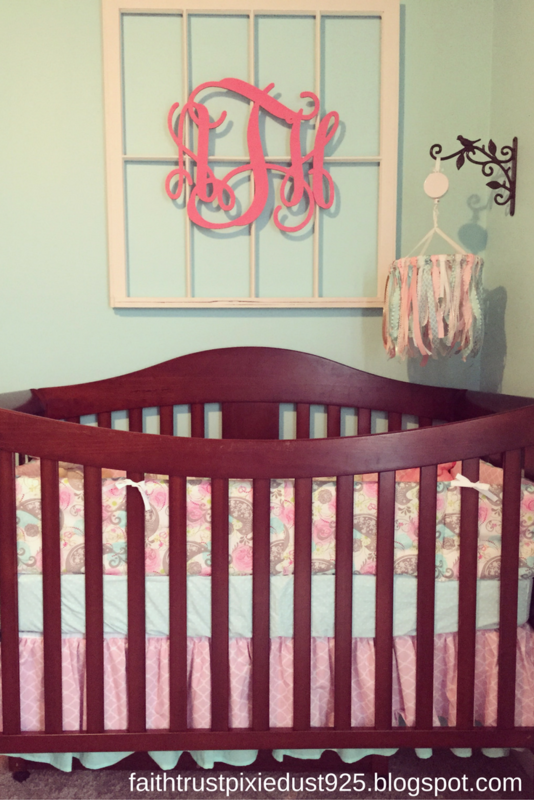 table covers, pack-n-play sheets, and bassinet sheets. The basket on the bottom shelf of the table has a bib, burp cloth and swaddle blanket for convenience during feedings. I’ll fill it with other things that I find I’ll need later – I’m sure there will be something! There you have it! What are your favorite storage solutions?